Whether you want it or not, the holidays are upon us! While it can be a magical, heartwarming time with family, it can also be a stressful couple of months, filled with gatherings and events galore. Lucky for you, we’re here to help you through the season! So, cutting to the chase, let’s delve into black tie options and alternatives. While you may jump to the conclusion that everyone will be wearing the same thing and you’ll be one in a sea of penguins, that doesn’t have to be the case. A custom 9tailors black tuxedo. First thing’s first. Fit is paramount. So, skip the rentals. The shoulders should sit snugly against your upper back. The jacket should be trim against your torso. Your tuxedo shirt sleeve can peak through your jacket sleeves. The pants are tailored through the leg and slightly tapered at the bottom. 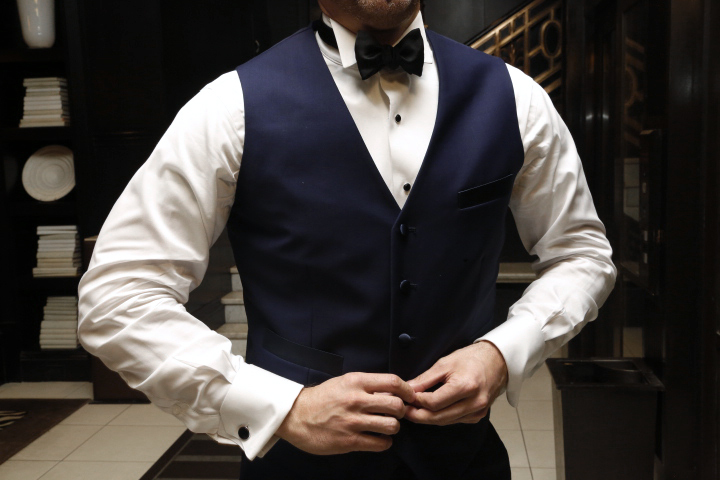 A standard tuxedo is black, or midnight blue, with a satin or grosgrain trim (including the stripe on the pants). Grosgrain tends to be the more traditional and refined option of the two. You’ll fasten the jacket with fabric covered buttons, but black or dark horn buttons are equally acceptable. Though these may be the traditional design points, you can customize your tuxedo to make it completely your own. To achieve the classic James Bond look, try midnight navy. Midnight navy tends to photograph darker and richer than a classic black. It’s a subtle difference in color, but makes a big impact on the dapper scale. A 9tailors client in his midnight navy tuxedo. Want to stand out in a sea of black and midnight navy? Try royal blue, grey or aubergine. These bright colors have been popping up all over the red carpet and runway. We love incorporating color wherever we can. A dusty blue or pale pink shirt are close to white, yet it’s still a clever way to sneak in some color. If you want to make an impression, look no further than the world of velvet. Velvet is definitely for the sartorially savvy. In addition to the buttery soft hand-feel, we also love the old-world feel of velvet. It’s not just for those cozy nights by a fireplace holding a cognac in one hand and cigar in the other (though we don’t discourage this!). If you already own a pair of black trousers, throw on a velvet blazer and classic bow tie. Need a tuxedo or want to update your black tie wardrobe for the holidays and new years parties? Take advantage of our tuxedo sale going on now through November 22. Or, email a Style Consultant at info@9tailors.com.